Bogs punctuate the rain forest throughout East Maui. High in the Hāna section of the rain forest on the northeastern flank of Haleakalā is a scattering of montane bogs. These openings of low vegetation, surrounded by rain forest, support a unique community of native grasses, sedges, and herbs. 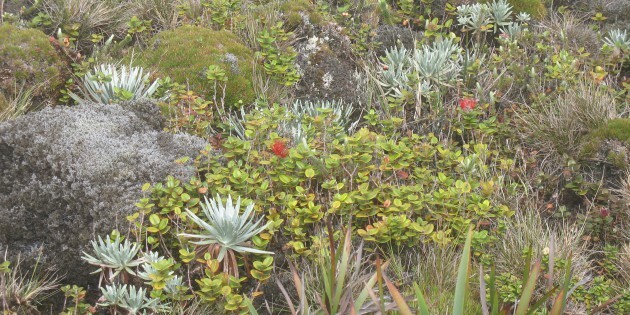 Dwarfed shrubs and trees such as ‘ōhi’a (Metrosideros polymorpha) also occur in bogs. Montane bogs are found in rain forests on the islands of Kaua’i, O’ahu, Moloka’i, Hawai’i and Maui. By the early part of the 20th century, naturalists had described most of the major bogs on the Hawaiian Islands—even those on Pu’u Kukui (West Maui). But a thorough investigation of the bogs on Haleakakā was not to begin until the 1970s. Since then, several field biologists have made plant surveys and other observations, studied plant succession in and around the bogs, and monitored plant growth in the bogs. Until the1970s, the bogs on Haleakalā were relatively undisturbed. Then researchers began to see and record signs of damage caused by feral pigs rooting in the bogs. Starting in 1979, the National Park Service began fencing some of the bogs to protect them from feral pig impacts. This unit introduces students to the montane bog environment of Haleakalā and the threats posed by feral pig damage. It also helps them learn basic field observation skills similar to those used by researchers observing the revegetation of Greensword Bog after it was fenced. Students watch and discuss a slide show to learn about montane bogs and the threats that feral pigs pose to this unique habitat within the Haleakalā rain forest. Students read about Greensword Bog and the damage that feral pigs did to the native plant community there. A reasoning activity helps them identify the main threats that pigs pose to rain forest ecosystems including bogs. Students also read about vegetation monitoring at Greensword Bog and analyze data from that study. Students conduct a survey of vegetation on school grounds, using methods similar to those used by researchers studying the Haleakalā bogs. 1. What makes the montane bogs in the Hāna rain forest unique? 2. What threats do feral pigs pose to bogs and other parts of the rain forest? Montane bog. Feral animal damage, protection, and ecosystem recovery. Field botany skills. Montane bogs are an important habitat for native rain forest plant species. Beginning in the 1970s, damage caused by feral pigs prompted protective measures for many bogs, and created opportunities to study the recovery of these native plant communities. • Extend Activity #2 by researching the impact of feral pigs on Hawaiian rain forests and preparing multimedia presentations, research papers, or oral reports. • Research the cultural importance of pigs in traditional Hawaiian culture and the importance of pig hunting in today’s society. • Debate maintaining pig populations for hunting versus eliminating pigs to protect forests. • Characterize environmental conditions in bogs in greater depth than is covered in Activities #1 and #2 and describe plant adaptations that enable them to survive in these conditions. • Haselwood, E. L., and G. G. Motter, Handbook of Hawaiian Weeds, University of Hawaiʻi Press, Honolulu, 1991. • Whistler, W. A., Wayside Plants of the Islands, Isle Botanica, Honolulu, 1995. • Wagner, et al., Manual of the Flowering Plants of Hawaiʻi, 1990. • Set up a monitoring project on school grounds that lasts for a few weeks, a whole semester, or longer. If there is a site that’s been disturbed by recent construction, students could monitor the regrowth of vegetation. This kind of monitoring project could help students understand the concept of succession. — To simulate a disturbance, students could sample vegetation in several plots then dig up the ground in some of them to monitor the growth of vegetation on the disturbed ground. The undisturbed sites could provide a base for comparison. — Another way to simulate a disturbance is to cover some plots with a dark-colored tarp for a couple of weeks. When the tarps are removed, have students sample the areas again, listing whether the plants are alive or dead. Sampling the plots periodically after that will enable students to monitor recovery of plant species. You may request a copy of the following three reports from the Pacific Cooperative Studies Unit, University of Hawaiʻi, 3190 Maile Way, St. John 410, Honolulu, HI 96822. Loope, Lloyd L., Arthur C. Medeiros, and Betsy H. Gagné, “Aspects of the History and Biology of the Montane Bogs, Technical Report 76,” in Studies in Montane Bogs of Haleakalā National Park, Cooperative National Park Resources Studies Unit, University of Hawaiʻi at Manoa, 1991. Loope, Lloyd L., Arthur C. Medeiros, and Betsy H. Gagné, “Recovery of Vegetation of a Montane Bog Following Protection from Feral Pig Rooting, Technical Report 77,” in Studies in Montane Bogs of Haleakalā National Park, Cooperative National Park Resources Studies Unit, University of Hawaiʻi at Manoa, 1991. Arthur C. Medeiros, Lloyd L. Loope, and Betsy H. Gagné, “Degradation of Vegetation in Two Montane Bogs: 1982-1988, Technical Report 78,” in Studies in Montane Bogs of Haleakalā National Park, Cooperative National Park Resources Studies Unit, University of Hawaiʻi at Manoa, 1991.